On the eve of eighteen-year-old Lady Helen Wrexhall’s presentation to the queen, one of her family’s housemaids disappears-and Helen is drawn into the shadows of Regency London. Alison Goodman lives in Australia with her husband and their Machiavellian Jack Russell Terrier, Xander. 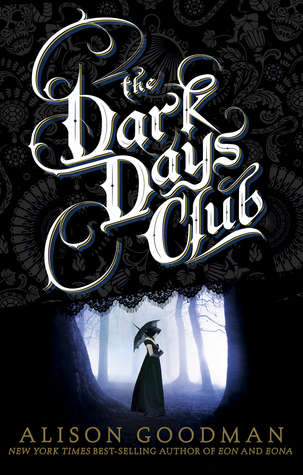 Her latest book is The Dark Days Pact, the second in a trilogy of historical/supernatural novels which Alison calls Pride and Prejudice meets Buffy (or Georgette Heyer goes demon hunting!). She is happily learning how to dance a quadrille, hoist herself into boned stays, and handle a small-sword...all in the name of research. Alison is also the author of the first book in the Lady Helen series, The Dark Days Club, and New York Times Bestsellers, EON and EONA (also known as The Two Pearls of Wisdom and The Necklace of the Gods). The award winning fantasy duology is set in a mythical China and has sold into 18 countries, and translated into 11 languages. Alison's other novels are the SF thriller, Singing the Dogstar Blues, and her wickedly dark adult crime novel, A New Kind of Death, which has just been re-released as a Kindle e-book. Her artist husband painted the cover, which is - Alison says without any bias, whatsoever - totally brilliant and the best cover she has ever had on any of her books. Noteworthy experiences while reading this book: Started out well but then the execution of this story fell flat. Notes and Opinions: We really wanted to love this one. We both love things that are paranormal but this one just took way to long to get to that stage. Endy DNFed this one around 70+ pages and I a little past that and we both just felt that this book just wasn't for us. The author said it was a slow burn but what we found was a story that could have been 100 pages shorter which would have made it a little faster. The entire time we read this all we got were historical references and a lackluster story full of characters that we just didn't fall for.